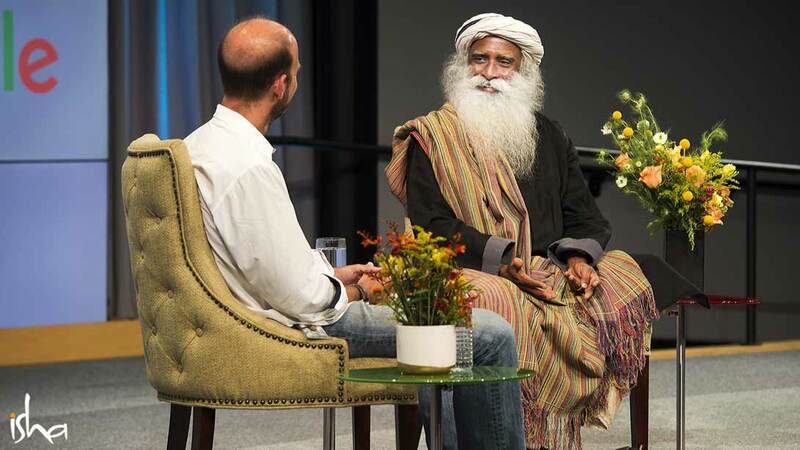 On October 3rd, Sadhguru was the keynote speaker at Google, where he addressed a crowd of 750 Google executives and employees on the topic “Developing an Inclusive Consciousness”. The talk was part of Sadhguru’s 17-city tour of North America to release Inner Engineering: A Yogi’s Guide to Joy, his first book written for western readers. Hosted by Jonathan Berent, Director of Customer Experience at Google, the talk also featured a panel of moderators made up of Google executives and VPs. Sadhguru spoke about how to create a culture of inclusiveness in the workplace and where we live. Individuals becoming more inclusive in the way they act and function is something fundamentally needed in the world today. Highlighting the recent tragic events that have happened around the world, Sadhguru emphasized the need to move beyond personal identifications and move into a more expansive way of experiencing life. Taking questions from the audience, Sadhguru spoke about politicians and the democratic process, the basic ingredients needed to create a peaceful world, and how to establish a more inclusive atmosphere for children to grow up in. Editor’s Note: Inner Engineering: A Yogi’s Guide to Joy, a New York Times Bestseller, is currently available in the US and UK. Order your copy now! The book will be available in India in December 2016.